On Friday, February 19, 2010 Tiger Woods finally spoke. After almost three months silence, the number one golfer in the world took to a podium in Sawgrass Clubhouse in Florida and addressed the nation. It was the moment many people had been waiting for since the night of November 27th 2009, when reports emerged that Tiger had been involved in a car accident. The revelations that followed the accident damaged, and continue to damage, the reputation of a man who is considered the most recognizable sports star on the planet. It was this reputation, prior to November 27th, that led to Tiger Woods becoming the best-paid athlete in the history of sport. He was the first billion-dollar athlete, a man who was the hottest property in sports marketing, branding and endorsement. 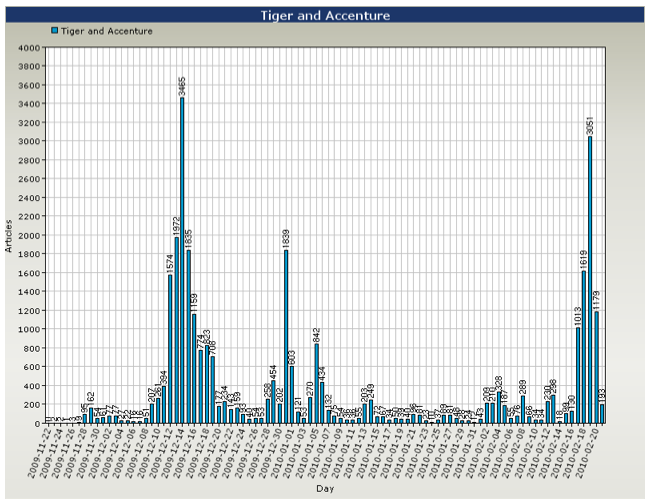 Other sponsors, including Tag Heuer have “scaled back” their marketing campaigns featuring Tiger. However, his main sponsor, Nike, and the computer game company, EA Sports, have stood by Woods. 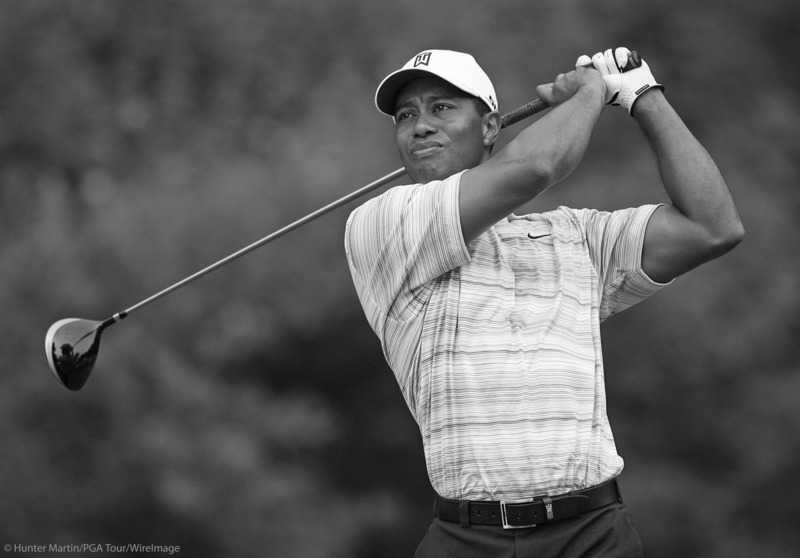 Despite publicly distancing themselves from Tiger Woods, which sponsors have remained associated with his name? 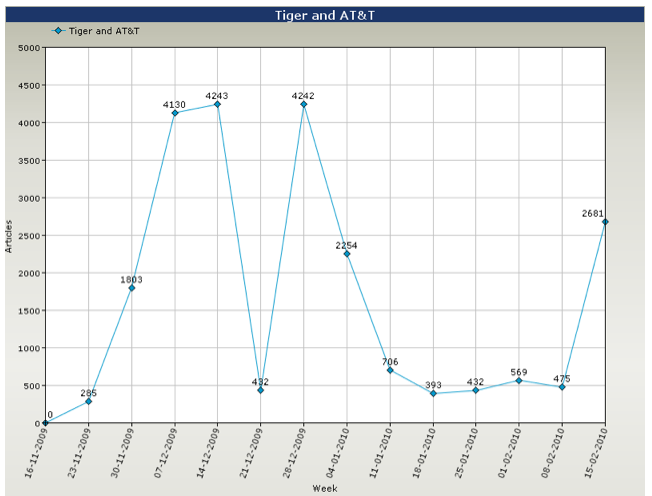 O’Leary Analytics has researched the coverage Tiger and his key sponsors have received over the past three months. On the 12th December 2009, Gillette announced they were limiting Tiger Woods’ role in their marketing campaigns. The move was the first in a series of announcements by key sponsors. 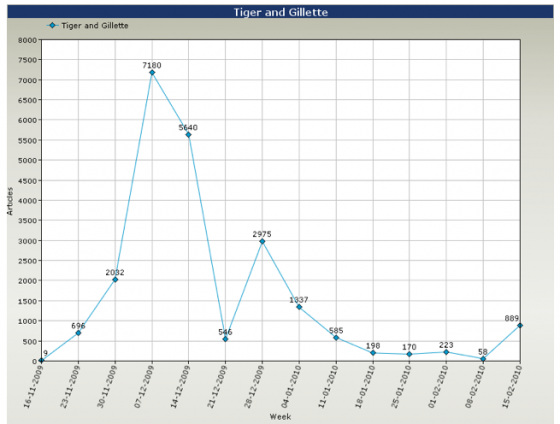 As the two graphs below illustrate, the announcement led to a peak in coverage for Gillette. 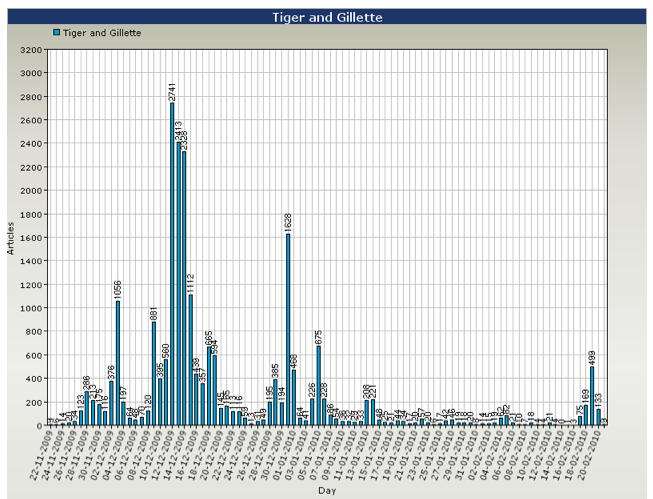 The first graph is a day by day breakdown of of all mentions of Tiger Woods and Gillette (in the same article) over the past 12 weeks. The announcement led to a peak of over 2,700 articles in a single day, and over 10,000 articles that week. As the first sponsor to publicly announce they were reacting to the allegations, coverage was always going to peak. 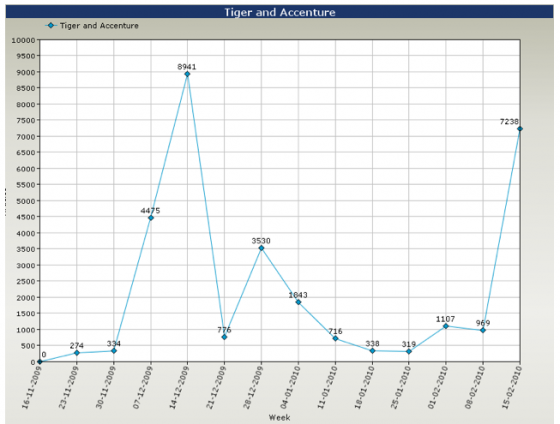 However, in the weeks and months since then, their Tiger coverage has been minimal, apart from a minor peak this week (of less than 1,000 articles), following Friday’s press conference. 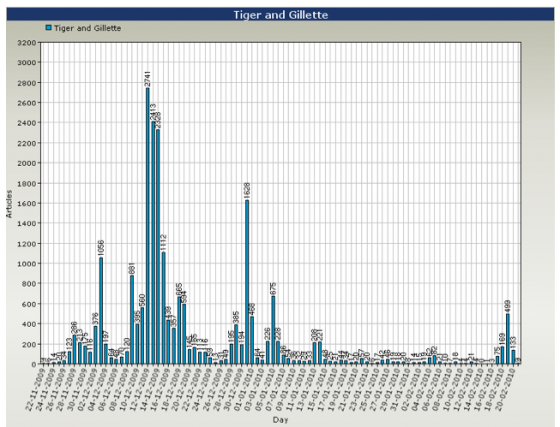 This graph is based on the same search criteria, but presented in a week by week breakdown of all mentions of Tiger Woods and Gillette (in the same article) over the past 12 weeks. 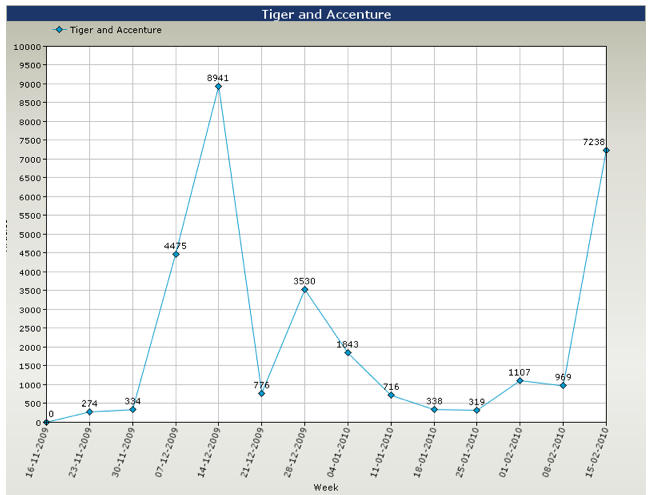 A day later, on 13th Decemeber 2009, Accenture announced they were ending their six-year sponsorship arrangement with Tiger. In a statement they said: “Given the circumstances of the last two weeks, after careful consideration and analysis, the company has determined that he is no longer the right representative for its advertising. Accenture said that it wishes only the best for Tiger Woods and his family”. However, unlike Gillette, the coverage didn’t end there. As the title sponsor of the Accenture Match Play Championship, a World Golf Championship event, Accenture retained a large interest in professional golf. Tiger was important, clearly, but unlike with Gillette, he wasn’t the only connection the company had with golf. What stands out from the above statistics, other than the high numbers, is that the peaks are in relative tandem – when one sponsor gets a lot of coverage, the others follow suit. 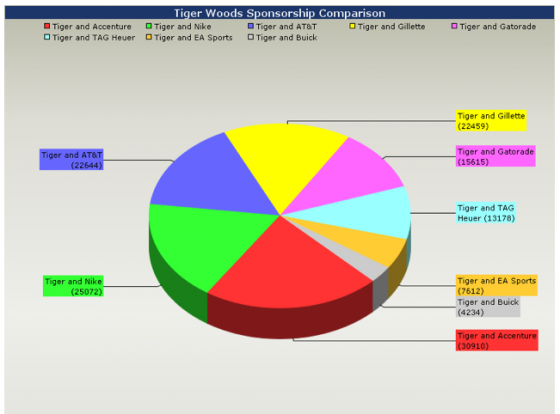 This illustrates that when reports of one sponsor leaving Tiger Woods emerged, the names of other sponsors were also mentioned. This is best illustrated in the segment featuring the 31st December 2009. 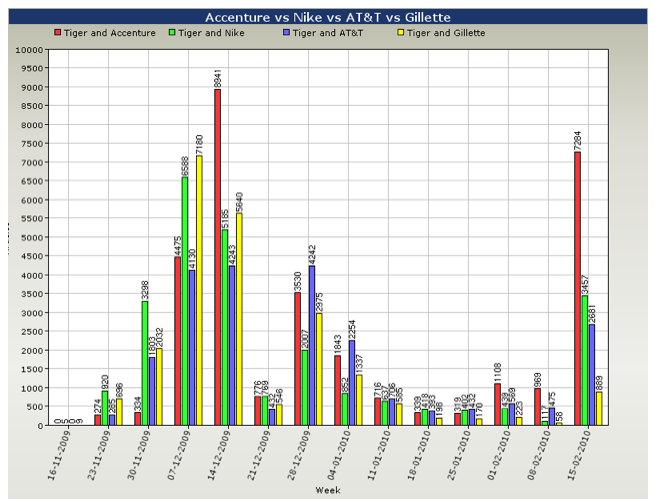 In the week AT&T made their announcement, both Gillette and Accenture (who had publicly dropped Woods two weeks previously) both received a spike in coverage. 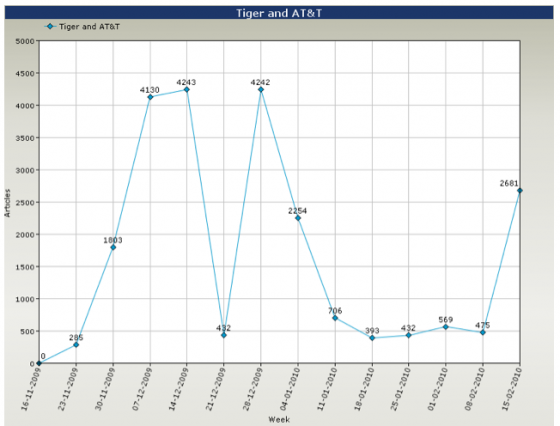 It is clear from the above data that three months after the story broke, the relationship between Tiger Woods and his sponsors, in the media, continues to evolve. He may not be on their website; he may not be wearing their logo; he may not feature in their advertising; he may not be carrying their name on his bag. 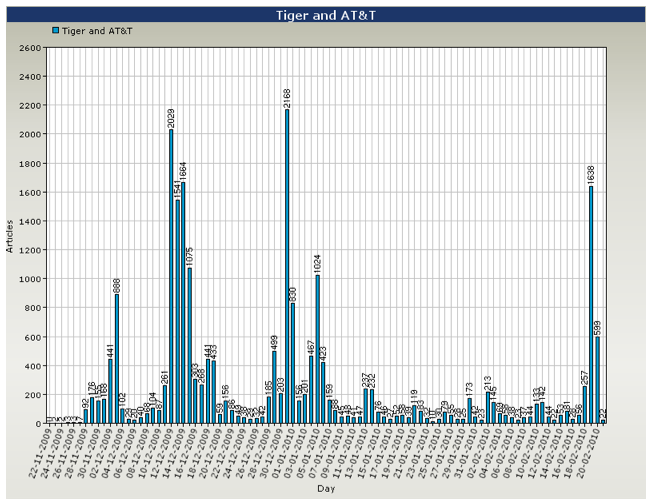 Despite all this, his association with these companies continues to be reported in the media. The final pie chart, below, represents the comparison between eight of Tiger’s sponsors, past and present, since the day of the crash up to Monday, 23rd February 2010. 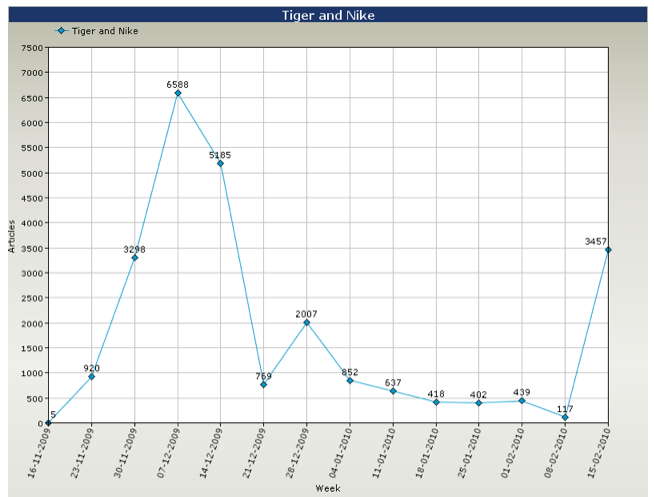 Nike, as one of the few sponsors to stand by Woods, will be happy to see that over 25,000 articles have been published since the night of the accident mentioning their brand and Tiger. However, proportionally, they rank second on the list, behind Accenture. Despite the company publicly distancing themselves from the player over two months ago, in excess of 30,000 articles mentioning both Accenture and Tiger Woods, have been published online. AT&T and Gillette are ranked third and fourth, both with over 20,000 articles during the same time period. Until Woods announces his return the game, these sponsors should see a decrease in their coverage. 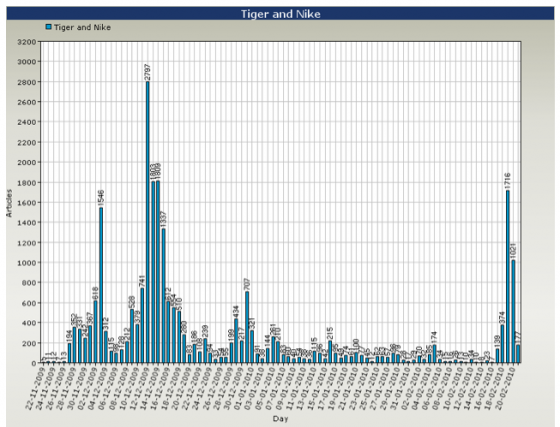 But if, and when he does return, or should an existing sponsor decide they no longer want to be associated with Tiger Woods, we should expect another peak for all his former sponsors. Being instantly associated with the most recognisable athlete on the planet was once the hardest thing for most companies to achieve. Distancing themselves from him in a time of scandal is proving even harder.